This grilled shrimp recipe is fast, easy and absolutely delicious! I adapted it from a recipe I tried from skinnytaste.com. The cilantro lime shrimp kebabs, with their cumin and salt seasoning, are both fresh and savory. The nice thing about grilled seafood is that it is not only tasty, but it is good for you, just whole natural foods. Yet, they taste like a Mexican fiesta in your own backyard. These cilantro lime shrimp skewers could be served as appetizers, as a main course with rice and beans and other vegetables or alongside a steak for some surf and turf! Enjoy them with a cold lager or crisp dry white wine. 1 lb raw, peeled shrimp: larger, fresh shrimp are ideal, but you can use previously frozen as well. As your grill warms up, toss the shrimp in a bowl with the crushed garlic, cumin, salt and half of the cilantro (1/8th cup). Then thread the shrimp kebabs onto the skewers, alternating shrimp and then a folded lime slice. Each shrimp skewer should start and end with shrimp. One pound of medium-large shrimp should make about 8 shrimp kebabs with about 4 or 5 shrimp on each. Brush your grill grate with olive oil. When the grill is very hot with direct heat under your cooking area, grill the shrimp. Shrimp cook very fast and just need to become opaque with hints of char marks on each side. If you cook them longer they will get tough. Medium-large shrimp over high heat usually only take about 1 to 2 minutes per side. 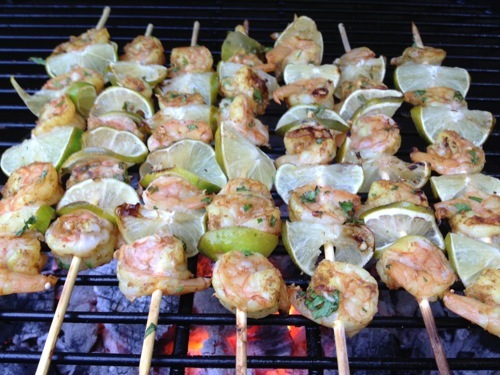 When done, remove the cilantro lime shrimp kebabs to a plate or platter and garnish with the left over cilantro and lime wedges to be squeezed over the cooked shrimp to taste. Done with the Grilled Shrimp Recipe? Return to the Barbeque Recipe page.